Tanager supports more Insider Threat programs in the federal space than any other services provider. 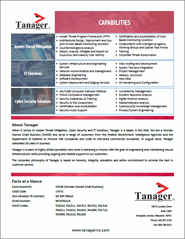 When it comes to Information Technology, Insider Threat Mitigation and Cyber Security, Tanager is a leader in the field. We are a Woman Owned Small Business (WOSB) and serve a range of customers from the Federal Government, Intelligence Agencies and the Department of Defense to Fortune 500 Companies and small to mid-sized commercial companies. In August 2018, Tanager celebrates 22 years in business. Tanager is a team of highly skilled specialists who excel in achieving a mission with the goal of engineering and maintaining secure infrastructures while providing ongoing and reliable support to our customers. Tanager Sponsors the Carnegie Mellon Insider Threat Symposium for a Second Year.